THQ and Sony are so excited about the release of Wheel of Fortune and Jeopardy Wii that they having decided to bring you a week’s worth of trivia here on Mom Start. Now, today is day three, so be sure to enter Day 1 and Day 2 as every day is an entry into winning your very own copy of Wheel of Fortune and Jeopardy for the Wii. There will be 5 winners total. Now you and your whole family can spin the iconic wheel as contestants on America’s favorite game show from the comfort of your own home as Wheel of Fortune finally comes to Wii. In this amazing re-creation, players take on the role of contestants battling for prizes and cash as they uncover letters in the show’s familiar turn based Hangman style phrase puzzle format. Mirroring the TV show, the game features 1-3 player support, allowing the whole family to play, or for two players or even a single player to face AI opponents as they solve over 8,000 puzzles built into the game. Along with the standard puzzle format, the game features "commercial break" mini-games and show related trivia that add to the fun and diversify the gameplay action. New and established fans of the show will also be delighted to see that the game contains Wii style representations of host Pat Sajak and the world’s most famous letter turner, Vanna White, both in standard studio attire, as well as themed outfits available when the game moves to in-game alternative locations, such as Hawaii. Combine all this with Wii Remote motion control functionality that lets players spin the wheel with a flick of the wrist and Wii Speak microphone capabilities (sold separately) that allow you to call out letters and solve the puzzles verbally, and you have an addictive video game Wheel of Fortune experience that truly does justice to the original TV game show. Now you and your whole family can enter the studio and take up the signaling button on America’s favorite quiz show as Jeopardy! comes to Wii. In this re-creation players take on the role of contestants battling for cash as they tackle categories both familiar and foreign, always remembering to phrase answers in the form of a question. Mirroring the TV show format, the game features 1-3 player support, allowing the whole family to play, or two players or less to face AI opponents as they uncover the 2,400 clues built into the game. 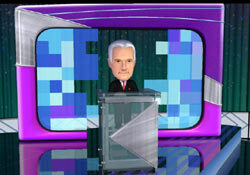 Along with the standard quiz show format the game features "commercial break" mini-games and show related trivia that add to the fun and diversify the gameplay action. 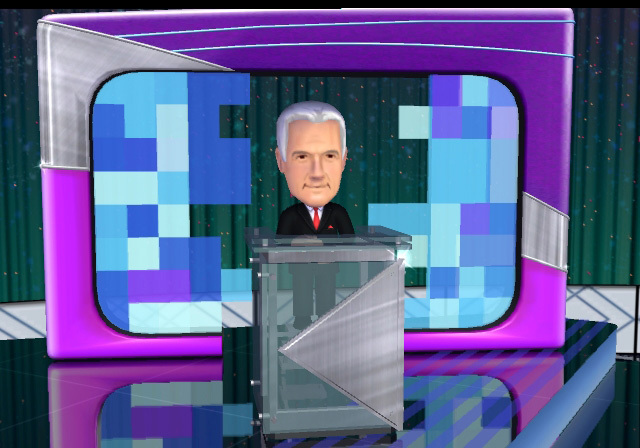 New and established fans of the show will also be delighted that the game contains Wii style representations and voice work by host Alex Trebek, as well as appearances by members of the Jeopardy! Clue Crew who provide occasional visual clues. Combine all this with Wii Remote motion control functionality that lets players ring in with the push of a button and Wii Speak microphone capabilities (sold separately) that allow you to provide answers verbally, and you have an addictive video game Jeopardy! experience that truly does justice to the original TV game show. Answer the questions of the day in the Google Doc. 1. What was the original show title for Jeopardy!? 2. When was Jeopardy! host Alex Trebek born? 3. Where was Vanna White born and raised? 4. In which year did Pat Sajak receive his star on the Hollywood Walk of Fame? Remember to go back and leave the answers to the questions from Wheel of Fortune and Jeopardy trivia day 1 and day 2. Don’t forget to come back tomorrow for more chances to win. Giveaway ends December 13th. It took me forever and a day to get the answer to number 4!